The instructions vary depending upon whether you have a Rackspace Email or Rackspace Exchange account. Access your account via webmail by visiting: http://apps.rackspace.com. Fill in your email address and password, then click the Log In button. In the upper right corner, look for a nondescript icon of three horizontal lines. Click on it and select Settings. In the Auto-Reply section on the right, change the Status from Off to On, then type in the message that you’d like people to receive. Optionally, if you’d like to enable it during a specific timeframe, enable this feature and set the date range. Click on the three horizontal line icon again and select Log Out. In the upper right corner, click the icon that looks like a gear and select Automatic Replies. Click the Send Automatic Replies button. Type in the message that you’d like people to receive. Click on your name in the upper right corner and select Sign Out. 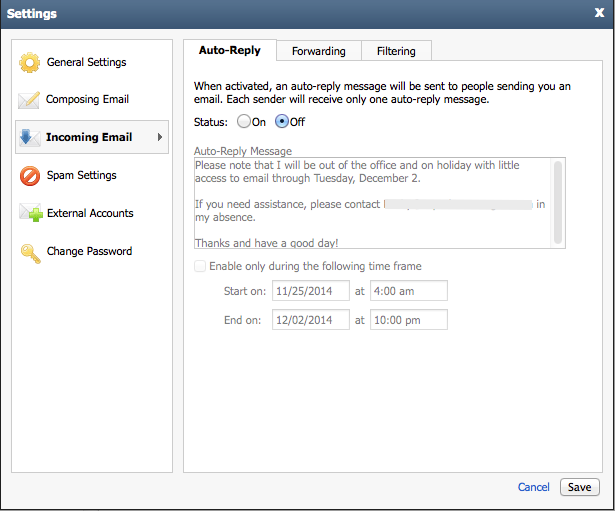 Read more about auto-reply, email, Exchange, Rackspace, setup.